By eating more foods high in fiber you can become part of a legend; those who have the nutritional wisdom to ensure better health, counteract disease, and produce lifelong vitality. One of the main reasons for the emerging trend of a diet with rich in fiber is the ongoing quest for weight loss. The average American consumes about 5-13 grams of fiber daily, but nutrition experts recommend a daily intake of 25-35 grams. Here's what you can do in your quest for the high fiber diet: Start by replacing white bread with whole grain bread, white rice with brown rice. Add more beans and legumes, veggies, fruits, seeds and nuts. Any foods with more than 4 grams per serving are categorized as food high in fiber..
People are moving away from the low-carb diet fad towards eating more fiber rich foods. The number of new products making high-fiber claims has nearly doubled in the past few years. For example, Sara Lee (bless her heart) has developed a white bread with all the fiber and many of the nutrients of whole wheat bread. And wonder of wonders, Wonder Bread has made a loaf with a special 100% whole wheat flour milled from white wheat. These products make the new USDA Food Pyramid much easier to scale. A diet rich in high fiber foods is essential for your ultimate health. Dietary fiber is vital for prevention or treatment of diverticulitis, diabetes, colitis, irritable bowel syndrome and Crohn's disease. Studies have shown that certain conditions such as constipation, hemorrhoids, diverticulosis and high blood pressure respond favorably to a high fiber diet. Those who need a gluten free diet can still benefit from a variety of high fiber foods. Certain types of fiber can even lower blood cholesterol levels. are as important to their health . . .
as it is to yours. One of our greatest concerns is the alarming number of today's children that are overweight. The new Food Guide Pyramid recommends that children consume 1 to 3 servings of whole grains daily. It's probable that most children don't even eat 1 serving a day of whole grains. 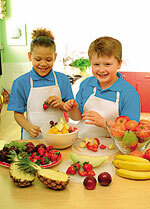 Dietary fiber has a powerful impact on children's overall health. After eating fiber-rich foods, there is a feeling of fullness which helps to control overeating. Fiber also helps regulate blood sugar which is vital to children's energy and digestive health. Irritable bowel syndrome - What is it? IBS is an ailment that affects mainly the bowel or large intestine. For IBS people certain foods may cause cramping, bloating, gas, diarrhea, and constipation. Weight loss is no secret - eat fewer calories; burn more calories. Substitute high fiber foods for your processed carbohydrates to reduce your daily calories and skyrocket your health. A gluten free diet must still be rich in high fiber foods,although gluten in wheat must be strictly avoided.There are many alternatives that are also high in fiber. We know how easy it is to raise your high fiber IQ! Explore these many links to educate yourself and those you love about high cholesterol, diabetes, certain types of cancer, high blood pressure, and other ailments that can be drastically improved or controlled by including high fiber recipes and high fiber menus on a daily basis.